Photos was created to replace iPhoto (which was more than a decade old!) and its newer, more professional brethren, Aperture. Newer code means a faster app and more features. ‘Photos: TMM’ is more than a book; it’s a weighty tome. No stone left unturned. Lesa explains all of the new features and how to get the most out of them. ‘Photos: TMM’ can answer any question that you should have on whether or not you can perform a specific function within Photos or whether you need to look to a third party app for help with some heavy lifting. In short, Photos the program lies somewhere in between a program for family shots and an app for professionals. Lesa is most impressed with how logically Photos simply organizes your pictures and videos by years, collections, and moments. Plus its powerful organizing and search capabilities. Just reading excerpts from this manual, I learned several things. Not being much of a shudder bug (although, oddly, I have a B.A. in film and video), it had never dawned on me to apply keywords to my photos, so as to simplify my searches. I keyword my reviews and music but never thought of applying the practice to my photos. DUH! Another ‘flat head’ moment! And she takes this concept much further explaining everything that you could possibly want to know about your photo’s meta data. What I found most useful was browsing the index. To read the book from cover to cover would no doubt make you a Photos ninja but would probably consume six months of your life. But if you have a particular issue that you need to address immediately, you can zero in on that very simply. Or if your desire is to become a Photos ninja after all, you can digest all the information in blocks over a period of time. ‘Photos: TMM’ walks you through the steps to migrate your photos from either iPhoto or Aperture into your Photos library. And too many other topics to even begin to list. Plus the part of any manual that I tend to use the most: Troubleshooting. ‘Photos: TMM’ explains in detail the incredible amount of editing tools from simple rotation and cropping, to removing scratches, blemishes and such. I learned that “you can easily copy and paste those edits onto another image.” Maybe a no-brainer for you but, as I said, I only dabble in taking pics. So, this was a real eye opener. Learn how to make slideshows and movies. How to create custom books, cards and calendars. Even how to add text to your photographs. 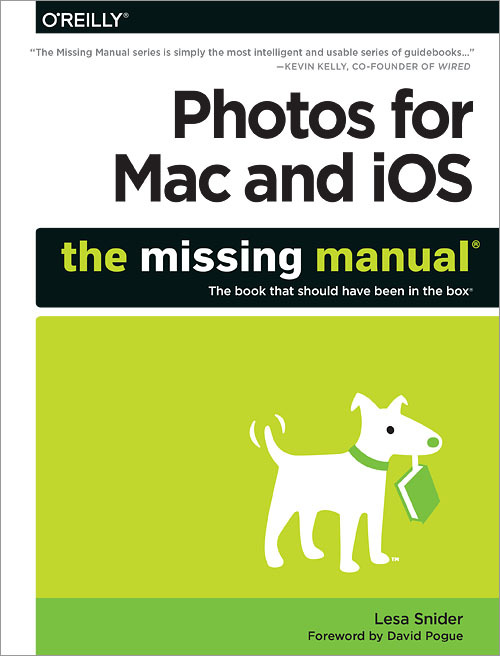 The other bit about this manual that I found to be most impressive is that it covers thoroughly both versions of Photos: the OS X version of Photos for your desktop and the iOS version, as well. Photos:The Missing Manual is currently available from O’Reilly Books in hard copy for $29.99 or various electronic formats (ePub, Mobi, PDF) for $25.99. And if you like to keep all your bases covered, you can bundle the hard copy and eBook for $32.99! There’s also a free sample that you can peruse . Just scroll down the page. This entry was posted on Monday, September 28th, 2015 at 3:52 pm	and tagged with Apple software, Frank Petrie, Lesa Snider, Manual, O'Reilly Books, Photos, The Missing Manual, tutorial, YMP, YMP YMPNow, YMPNow and posted in Reviews. You can follow any responses to this entry through the RSS 2.0 feed.